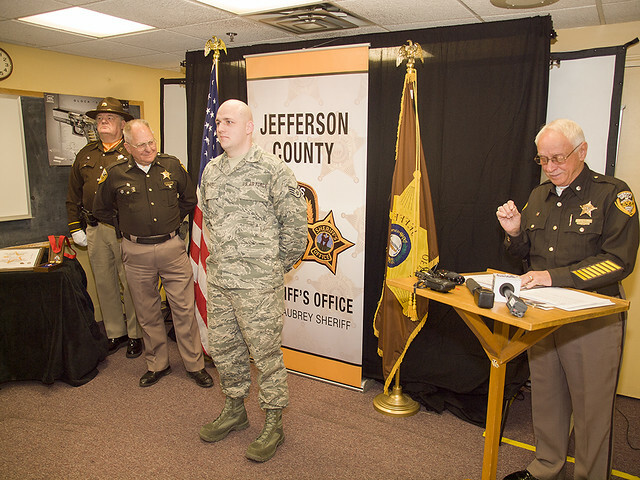 KENTUCKY AIR NATIONAL GUARD BASE, LOUISVILLE, Ky. – A Kentucky Air National Guardsman has been awarded the Medal of Valor from the Jefferson County Sheriff’s Office for actions he took during a shooting incident at Fern Creek High School last year. Staff Sgt. 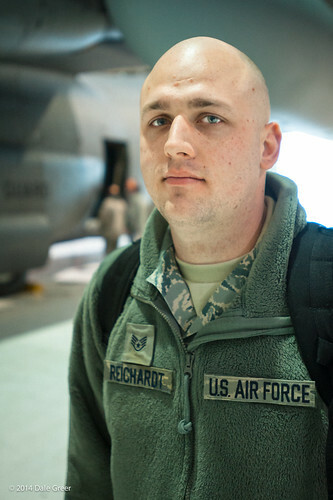 Brent Reichardt, an aircraft hydraulics specialist in the 123rd Maintenance Squadron here, works full-time as a Jefferson County Sheriff’s deputy and school resource officer. He was on duty at Fern Creek High School Sept. 30 when a student pulled a gun during an altercation with a classmate and shot another student in the abdomen before fleeing the scene. As the first officer to respond, Reichardt’s split-second decision-making helped save the life of Javaughntay Burroughs and ensured that other students were safely evacuated from the last known location of the suspect, officials said. Reichardt also facilitated the arrival of back-up officers and eventually helped locate the suspect. Jefferson County Sheriff John Aubrey said Reichardt exemplifies a man of character. Reichardt expressed his surprise about receiving the award, which was presented during a ceremony at the Sheriff’s Office Feb. 20. The Medal of Valor is presented to deputies who demonstrate bravery, perseverance, initiative and dedication to duty in the face of imminent personal danger. The alleged shooter has been indicted on multiple charges, including assault in the first degree. The victim is currently recovering from his injuries.